1. Limited Edition White Treasure Clock You can never get back lost time, but with this ultra-creative and modern clock you can reminisce without losing track of time. A square board adorned with vintage toys and a minute and hour hand make this timepiece an interesting sculptural and functional accent to your walls. These found objects, such as tiny stuffed animals, a cassette tape and a plastic horse, will make you smile about the past, but still keep you in the present. Limited Edition. Natural birch and hand-colored in white. 2. OFFI My Pet Lamp Dachshund in White The playful MyPetLamp-Dachshund from Offi is made of non-toxic, odorless plastic with a low voltage (12v) replaceable bulb that bathes a room in soft light. 4. Bin Bin Waste Paper Basket by Essey of Denmark The Essey of Denmark Bin Bin Waste Paper Basket makes a playful, eye-catching statement while aiding in keeping the office area tidy. The Bin Bin Waste Paper Basket was designed by John Brauer and features polyethylene. It is offered in the US by Ameico. Ameico, headquartered in Connecticut, hosts original works by contemporary designers, offering an array of well-designed products for modern sensibilities. 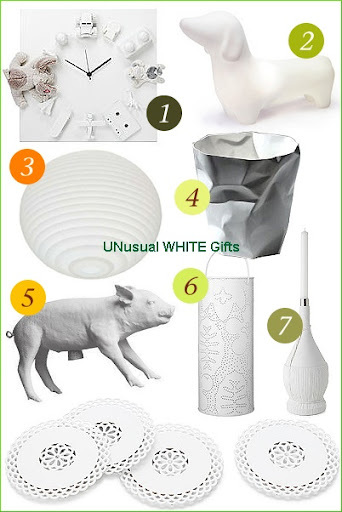 6. notNeutral Season Lantern in White The offerings from notNeutral are, as it says on the box, not neutral. Their bold, graphic look is excellent for anywhere you want to add some uncommon interest to your decorating, from the nursery to the living room to the dining room.Enhance your outdoor experience with these Season patterned metal lanterns in three sizes. They are dramatic Moroccan and Mexican-inspired lanterns that illuminate with candles through tiny pinholes to create an intimate evening glow. Delicate yet dramatic, they light up tables, pathways, beaches and backyards.Each size comes with a removable candle armature that makes candle lighting a snap. They have a painted finish to be used outdoors and can be set down on the patio or hung from a tree. 7. Ristorante Candle This cast of an old-fashioned Chianti wine bottle by Harry Allen will have you looking for a red-checkered table cloth and a bowl of spaghetti and meatballs. It's authenticity is unmistakable as the mold has captured every detail from the paper-thin wine label to the textured straw covering. And just like in an ristorante italiano this empty bottle is meant to hold a candle, which will in turn melt trails of colored wax all over this white sculpture. A thoroughly modern interpretation of a traditional restaurant accent. In a fusion of tradition and modernity, this coaster set combines the crocheted lace of a doily and the functionality of glossy white metal and cork to make the perfect coaster. Originally, lace doilies were used to protect tables from dishes, so it only makes sense that they would be re-imagined into a pretty home accent that protects your furniture, but without the whole 19th-century vibe. Set of four.